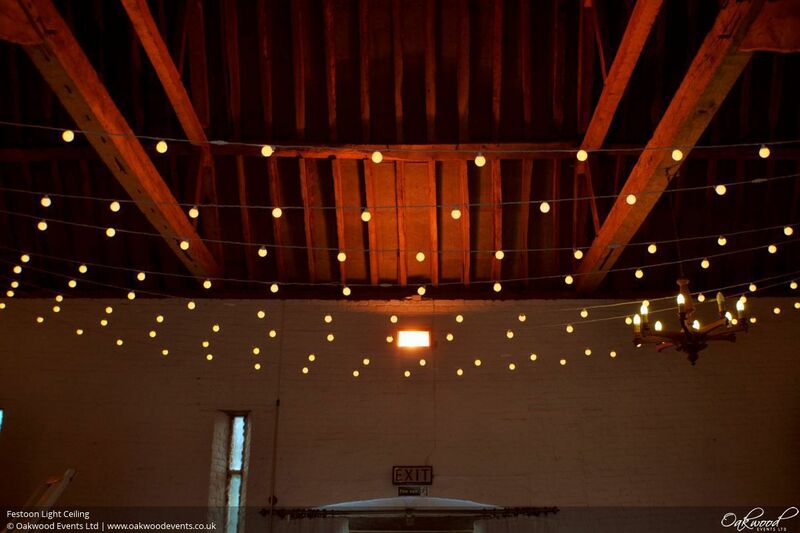 Festoon lights are a really popular choice for lighting weddings, and with good reason! 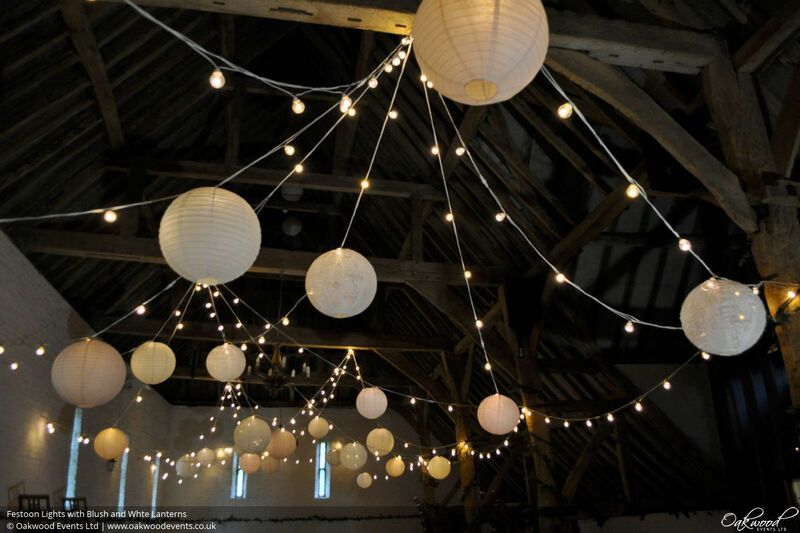 Festoons give lots of lovely, warm light whilst looking stylish and they make an amazing backdrop for wedding photos. 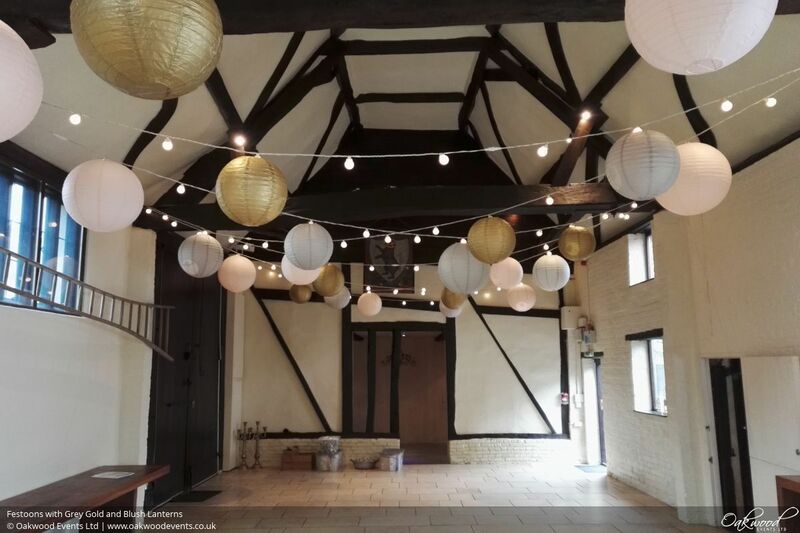 There are lots of ways to use festoon lights as wedding decoration including several styles of canopy, swags, backdrops and outdoors. 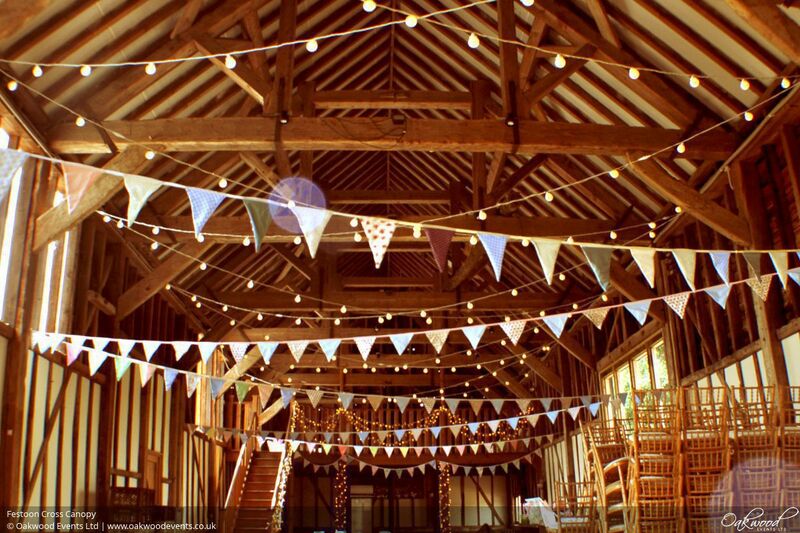 Combine festoons with paper lanterns, fabric drapes or bunting for some really pretty and unique designs. 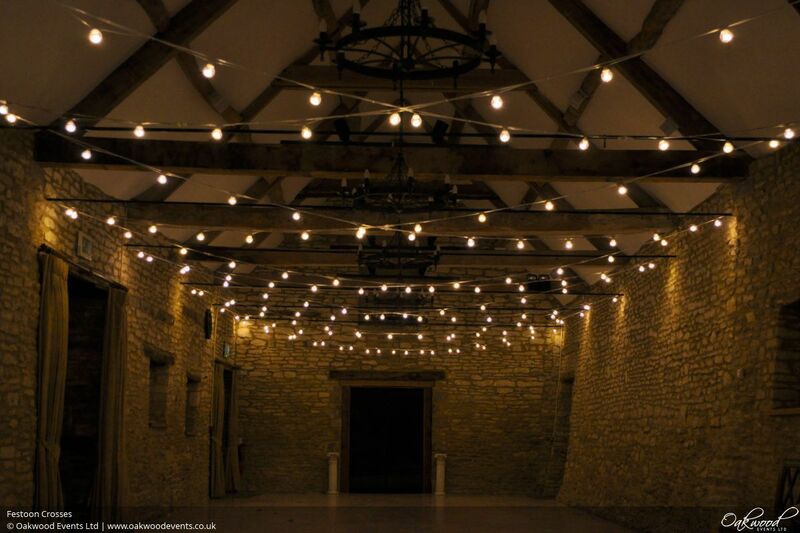 We supply festoon light hire for weddings in Oxon, Berks and Bucks including all equipment hire, installation and removal. 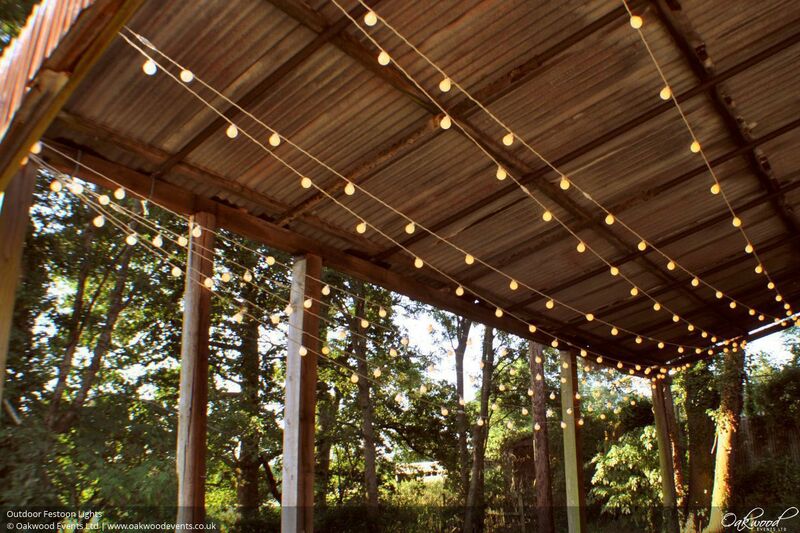 Read on for design ideas for using festoon lights to decorate your wedding. 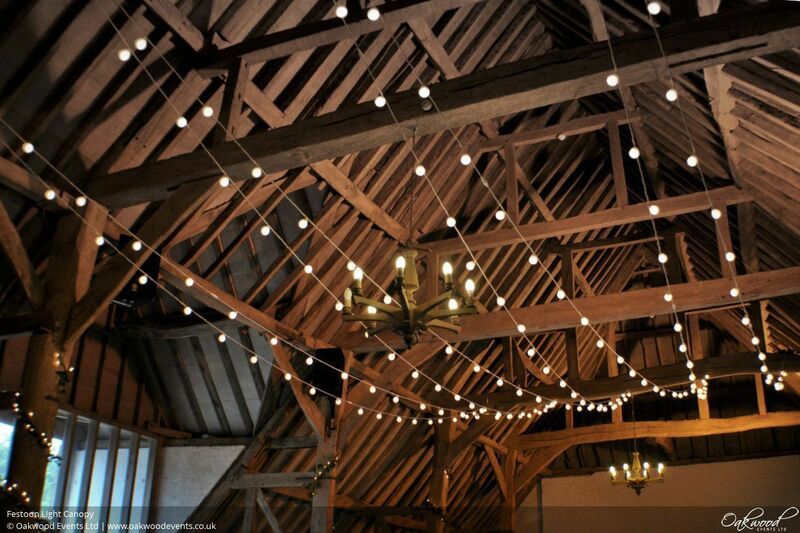 Suspended from the beam braces or beam ends, festoon lights are hung in a generous swag from point to point, creating crosses of lights along the barn. A great design in its own right and an excellent match for other décor elements such as bunting, drapes, lanterns and pom poms. 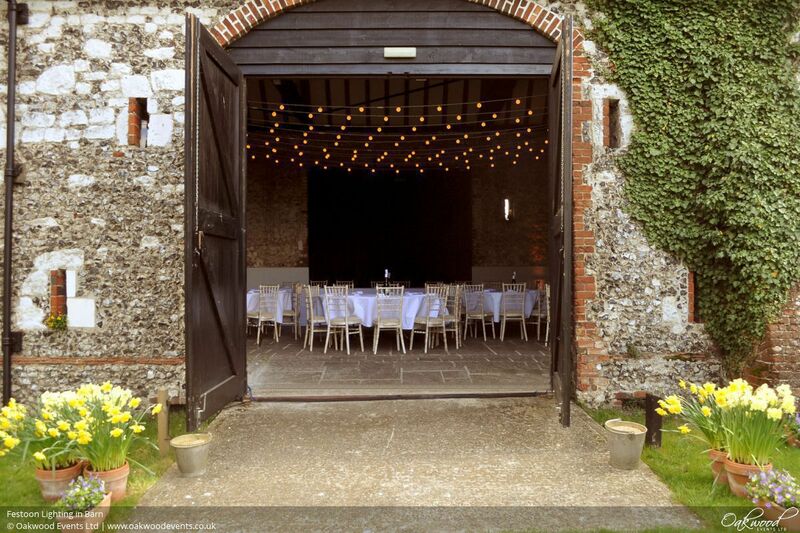 An impressively large canopy with an unstructured, luxurious feel. 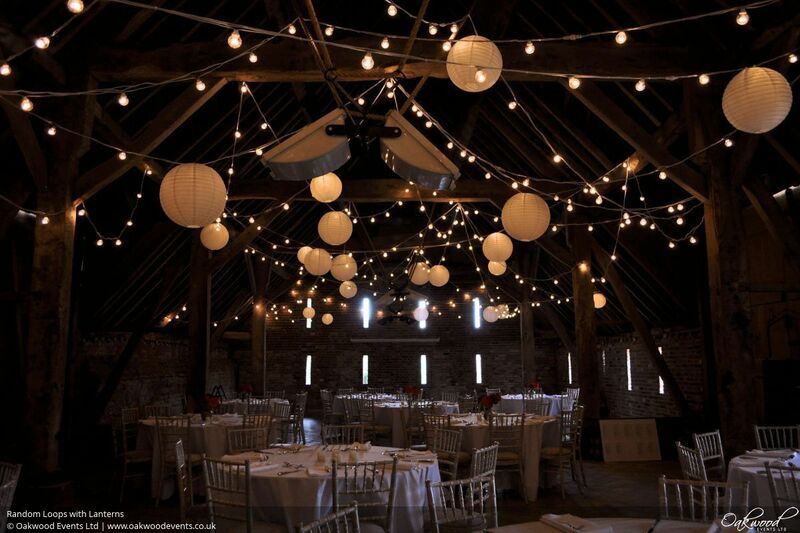 Hundreds of metres of festoon lights are hung around the barn in lots of loops of varying length and height. 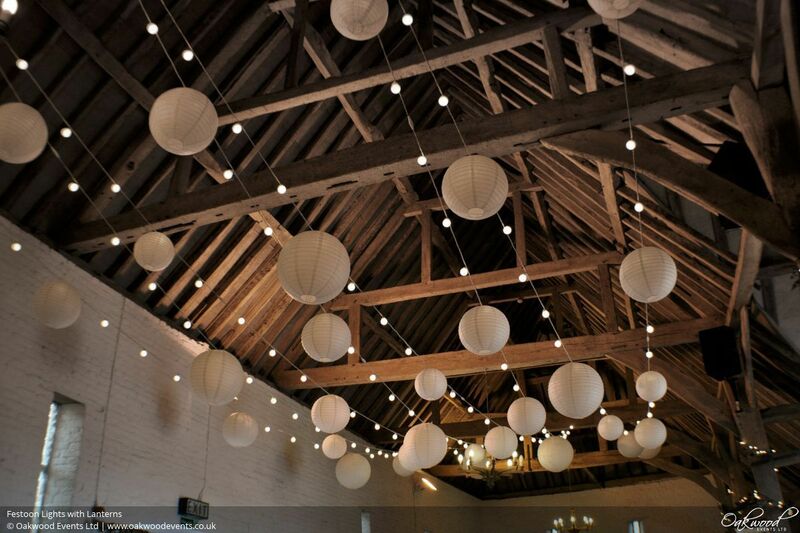 Optionally add paper lanterns to selected bulbs as a finishing touch. 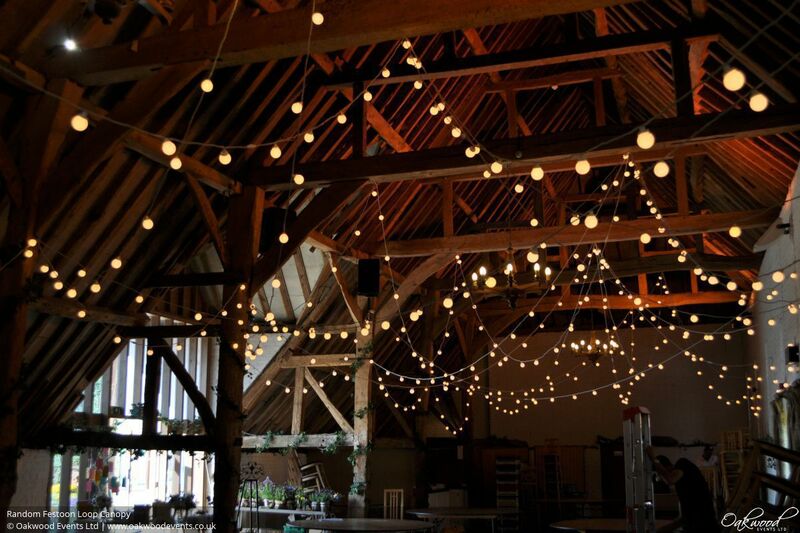 A single swag is created by zig zagging back and forth between two of the barn's main beams. 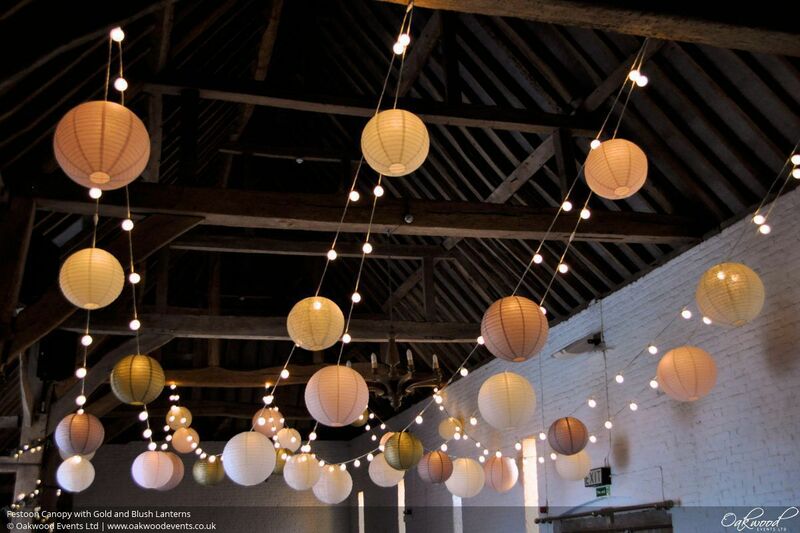 A great design for personalising with paper lanterns in a colour to match your wedding theme. 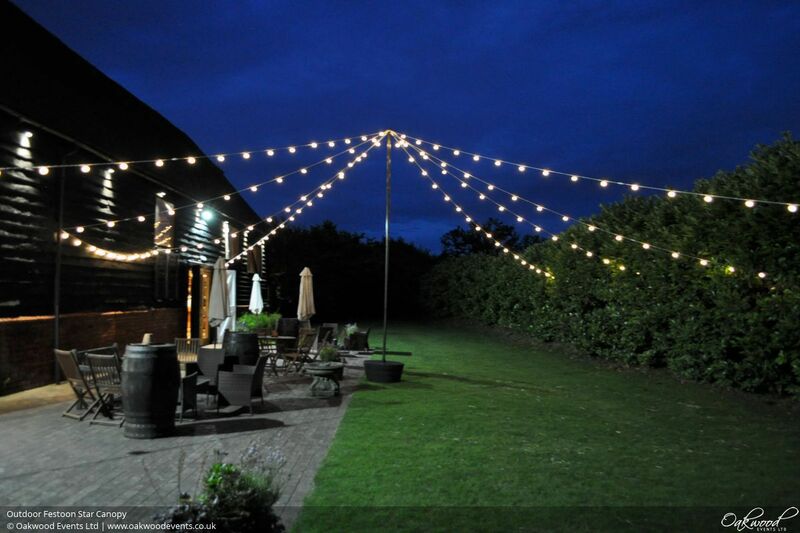 Widthways festoon canopies are great where a more dense look is required.. 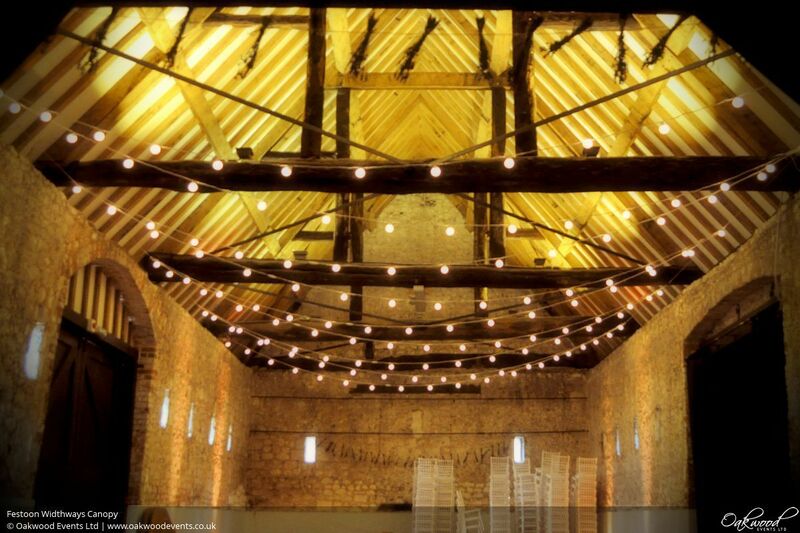 Lights are hung back and forth across the width of the barn at regular intervals to create a big impact canopy. 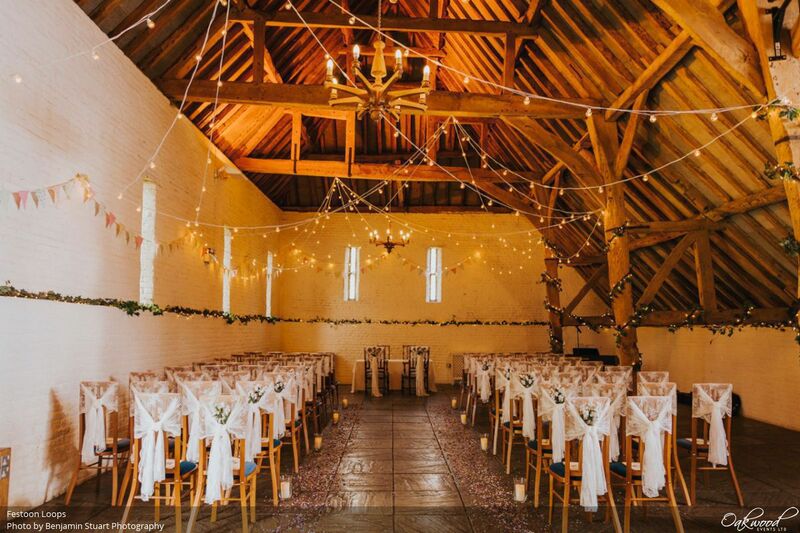 Hang festoons down a wall as a backdrop behind a ceremony or top table or use swags of lights under or between beams and other fixing points for a simple, effective display. 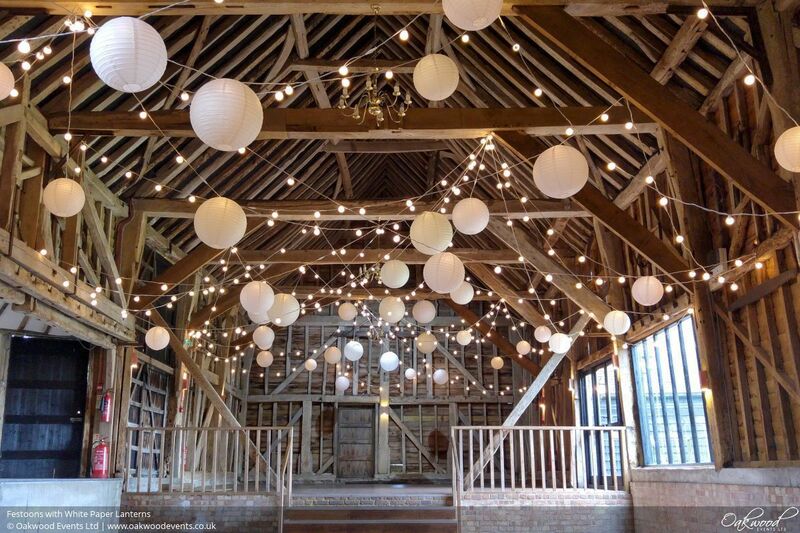 Festoons can be hung between buildings, along the edge of barns or buildings and look fantastic hung in the branches of large trees. They can be installed on poles to line walkways or along fences and patio railings. 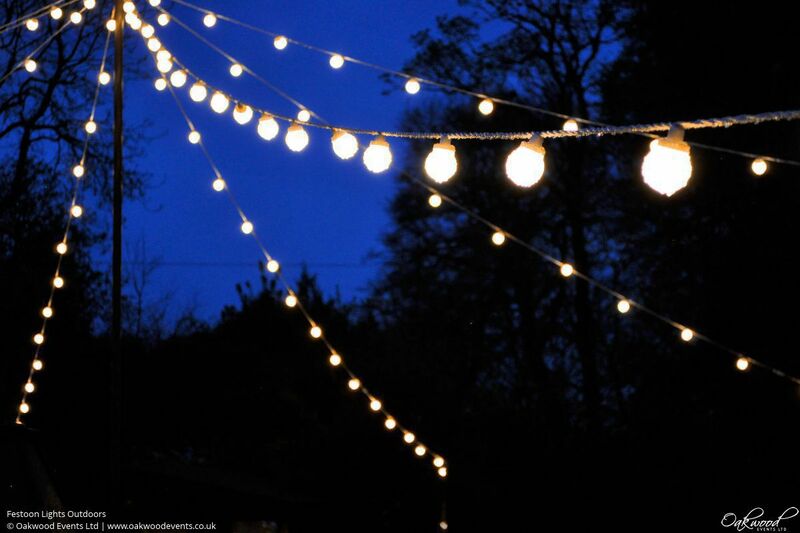 Our high quality connectable festoon lights are the perfect balance of style, safety and flexibility. The bulbs are spaced 50cm apart, with warm white LED bulbs on white wire. 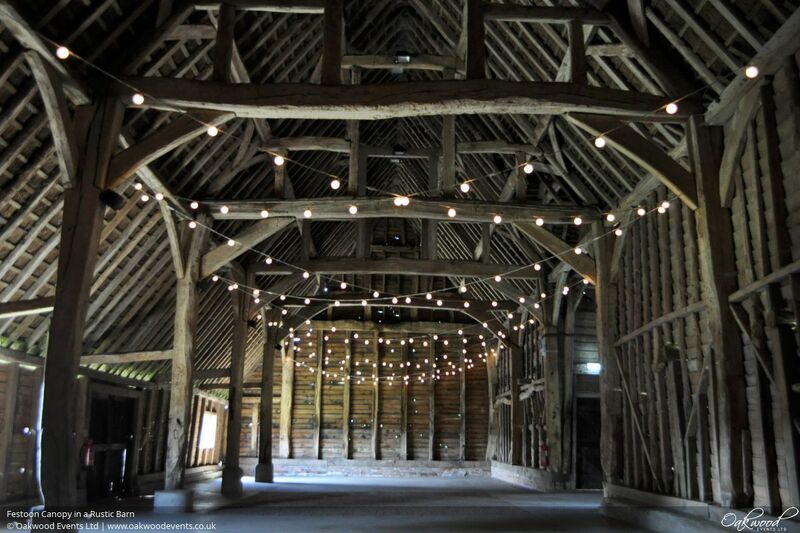 LEDs are reliable, with low power consumption making our festoons suitable even in rustic barns when power may be limited. 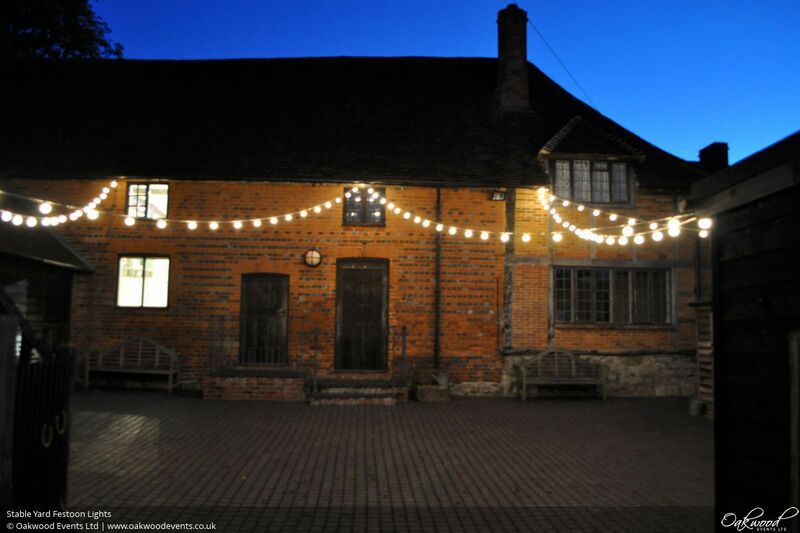 Because the bulbs don't get hot, our lights are also suitable for use close to delicate surfaces or fabrics, outdoors and when the lights are within reach. Being lighter weight than a traditional black rubber harness we can achieve longer spans overhead, opening up more design options both inside and out. 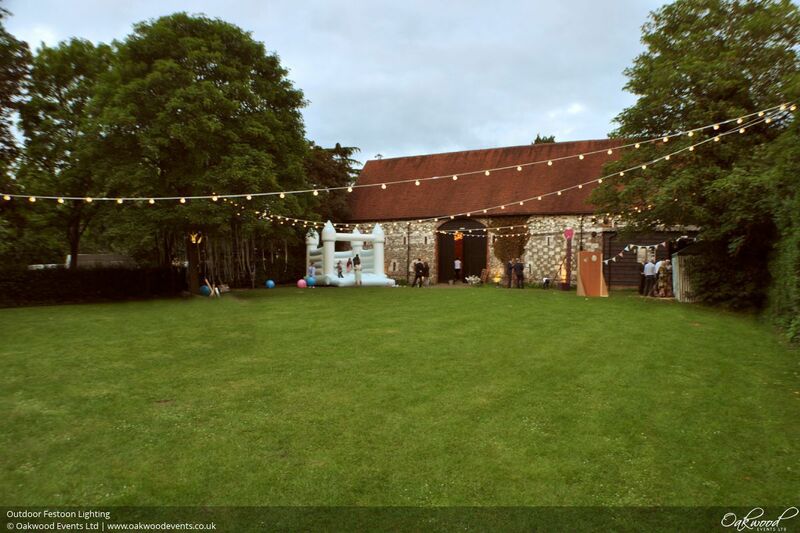 We install our canopies on dimmers so the right atmosphere can be set for the evening reception. 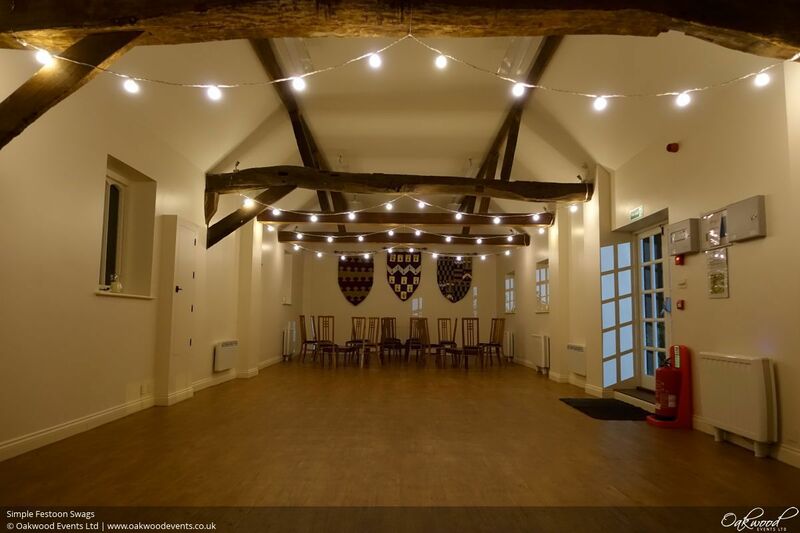 Experienced in working in old and listed buildings, we respect the venues where we work and use temporary, non-damaging fixings. We take safety seriously and can supply evidence of our public liability insurance (PLI) and portable applicance testing (PAT). We undertake working at height and electrical training and all of our ladders, scaffold towers and specialist equipment is regularly maintained and checked. 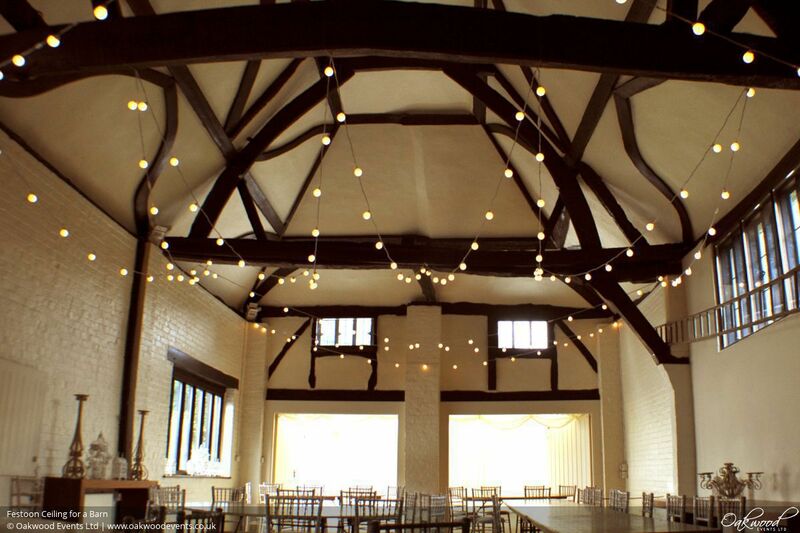 We pride ourselves on our smart, efficient and polite approach to installs and pack downs. 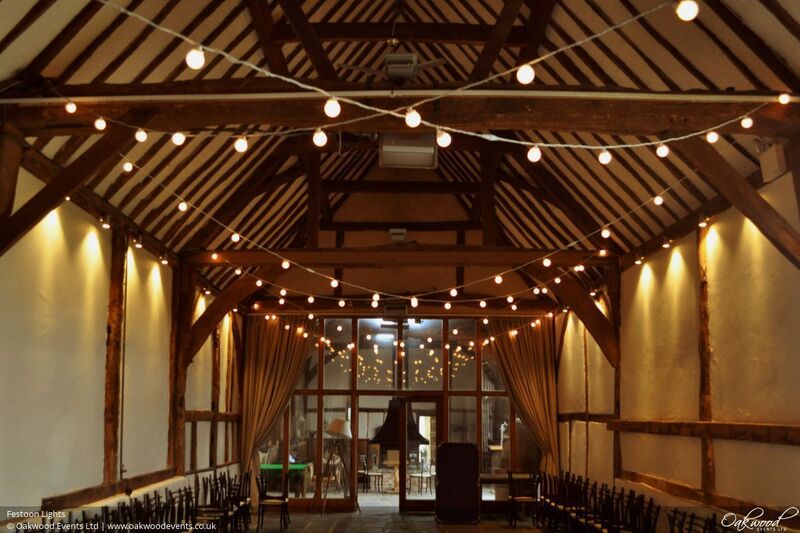 Our level canopies, technical excellence and designs that maximise the venue features are borne from our extensive experience specialising in barn lighting. 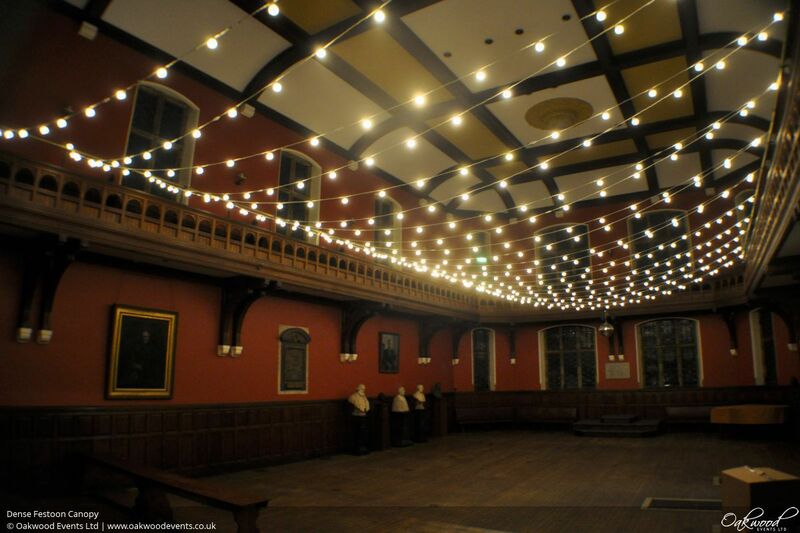 For lots more images of our festoon light installations, see our dedicated Pinterest board. 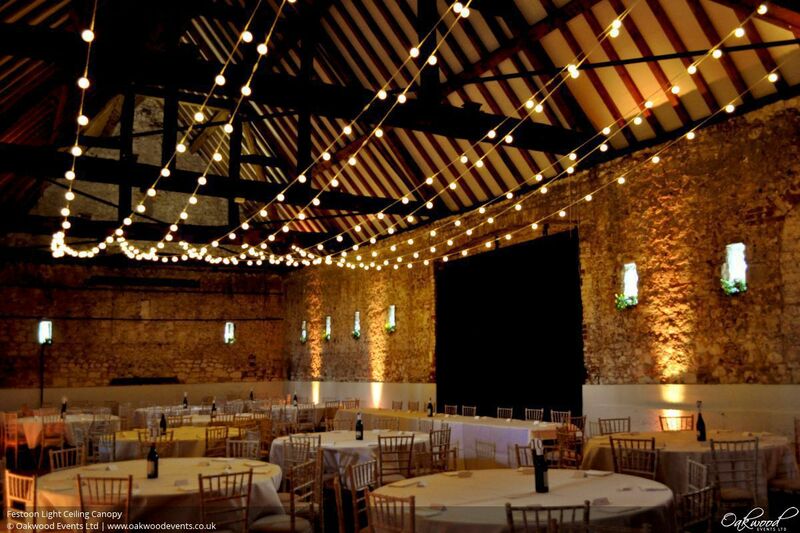 To discuss lighting options for your event or to enquire about hiring a festoon light installation, contact us here.